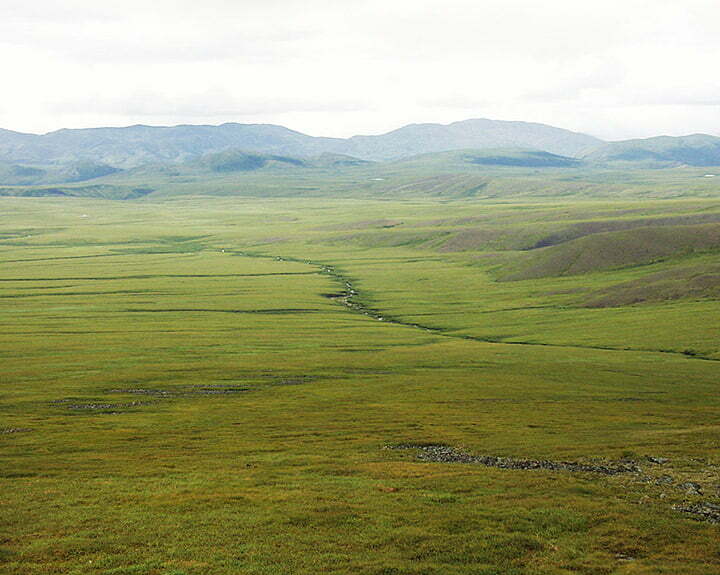 Eagle Plains is an expansive area of rolling hills between the Ogilvie and Richardson Mountain ranges along the Dempster Highway. The area is high in elevation and sits on permafrost, which means that it sits above treeline and the ground is covered in mosses, lichens, and shrubs. These plants burst into a fresh green colour in June and then turn to a fiery red in late August, giving this section of the drive awe-inspiring views. There are very few services or settlements between the start of the Dempster Highway and Fort MacPherson, but the Eagle Plains Hotel sits conveniently halfway between Dawson City and Inuvik. It is a self sufficient complex that includes a gas station, motel, dining room, showers, laundry, staff housing, and a government office.